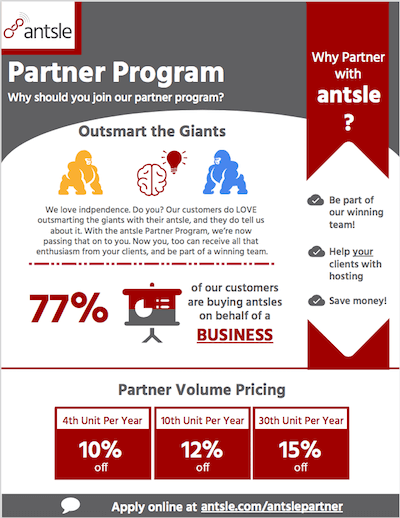 Why become an antsle partner? Not only can you live and breathe our vision by giving the power of self-hosting back to the people, but ﻿you﻿ can also ease the financial burden of monthly hosting fees for your clients. On top of participating in this exciting movement of decentralizing the web, you can also save money out of your own pocket. The more antsle units you purchase with us in a single year, the larger your savings! Since there is a need for your clients to welcome antsle into their lives, why not save some money in the process? Please fill out the following form if you are interested in receiving more information about our Partner Program including the in-depth guide.